Mobor beach is one of the beautiful beaches lying on the coast line of Arabian Sea. It is located at a distance of 16km from the Colva beach. It is located towards the south of Colva beach. This beach lies between the Arabian Sea and the Assolna River estuary. It is one of the popular beaches of Goa. It is greatly frequented by the adventure lovers and this playful beach has many activities to offer its visitors. It is a perfect place to take a break from the normal city life and to hide at the lap of nature laden beach of Mobor. There are many interesting activities one will find on the Mobor beach. Spending a vacation here rescues one from the dull days. One can revive one’s energy and refresh one’s mind to make one fit for working next few years by visiting this place. The beach has tremendous activities to offer to its tourists. 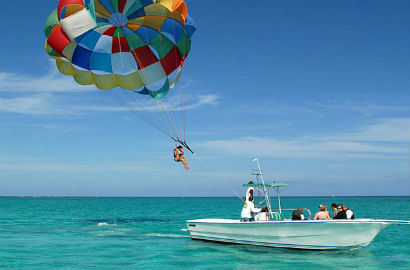 One will find many water sports like Jet Ski, Banana ride and water skiing on the beach. Most famous among the activities is the bilking on the sandy beach. Swimming and surfing must be assisted because of the presence of heavy undercurrent. Mobor Beach is a central hub in the city and offers good deal of relaxation to its tourists. Sun bathing is mostly enjoyed by the tourists here in this beach. The beach chairs and umbrellas are used for taking a deep relaxation on the beach. One must take a sun tan lotion to get an excellent tanning on the skin. Foreigners love the place for getting a tanning on their skin. It is a pastime for the foreign tourists as many of Indians do not love getting a skin-tan. The eateries located on the beach are contributing to the entertainment on the beach too. The food joints are great for tasting the delicious Goan food especially sea food of Goa. These joints are famous for providing Goan cuisine in affordable price. Shopping is another engaging activity near the Mobor beach. One can get handicrafts and antique shops around the beach. Tourists love to buy the decorative items from the beach-side shops. The most famous amongst the foreigners are the trinkets made out of shells and conches. One can view people buying these items in the beach side shops as well. Though it is a small beach, it is a power house for relaxing and taking a great break from the normal course of life. One can reach the beach by air and rail route. The nearest station is Karmali which is only 11 km from Panaji. One can take private taxis from Panaji to reach the beach. The nearest airport is Dabolim which is 68 km from Colva beach. One can hire taxis or autos to get to the beach.